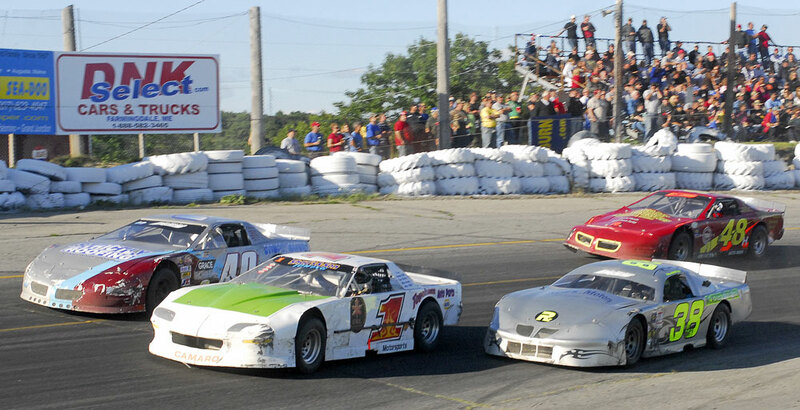 Naples ME (March 9) In an effort to better accommodate short track racing fans, the Pro All Stars Series (PASS) North Super Late Model Saturday, September 19 date at White Mountain Motorsports Park will move to Friday night September 18. 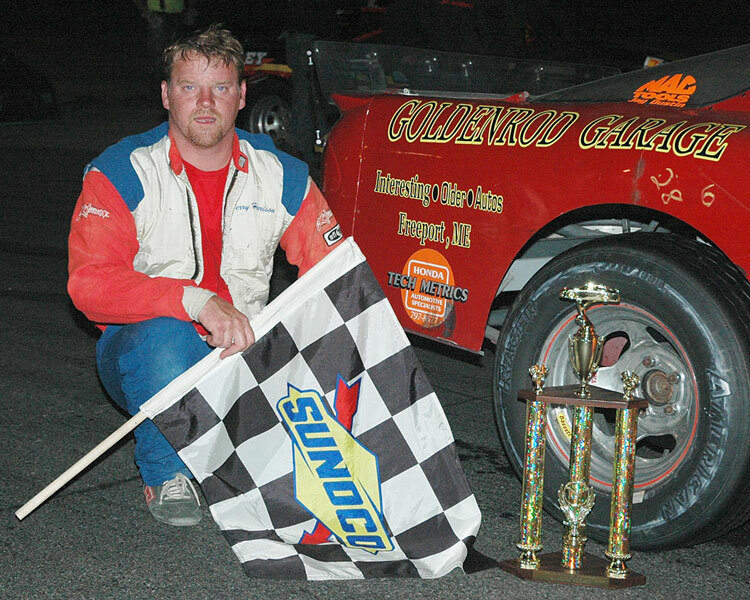 In other scheduling news, The PASS Sportsman series will wrap up their 2009 campaign and crown the 2009 PASS Sportsman Champion at Groveton New Hampshire’s Riverside Speedway on Saturday October 17th. 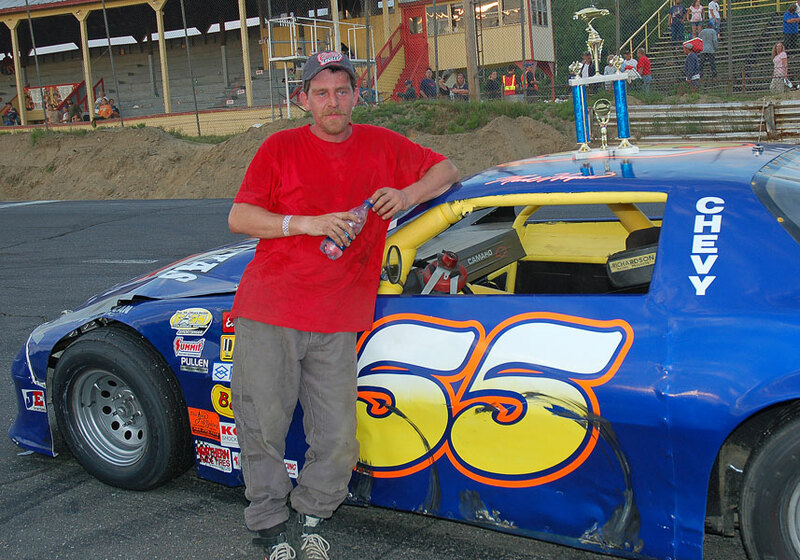 The addition of the Riverside Sportsman race completes the 2009 points schedules for all five PASS racing divisions and six racing series.
.: PULLEN Sportsman Champion - Dan McKeage - #38 - Gorham, ME :. 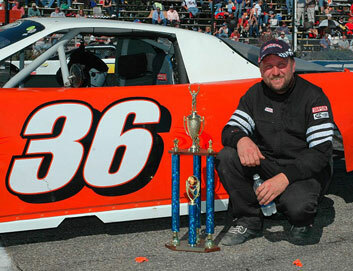 Winner Dan McKeage #38; & Clyde Hennessey #8x, 3rd. 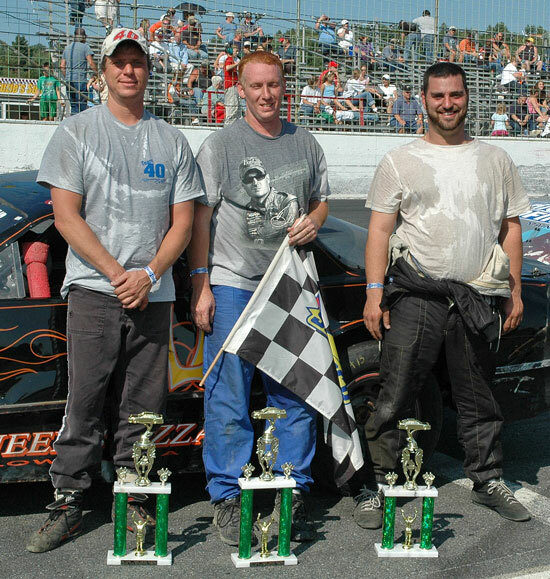 L to R: Nate Weston, 2nd; Winner Michael Landry; and Dan McKeage, 3rd. 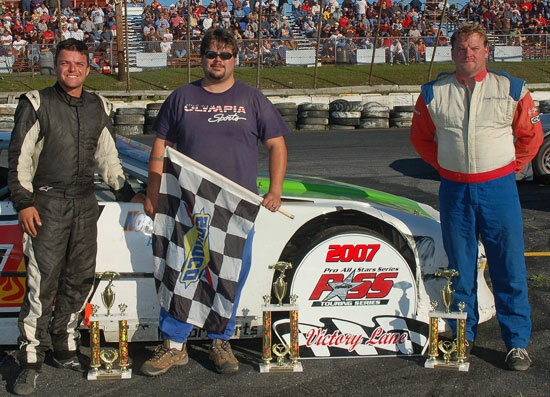 10 66 Ernest Wallace Jr.
12 2 Robert Emery Jr.
(Naples, ME – October 6, 2007) The PASS Sportsman cars rolled out for their 75-lap feature with the 35X of Kris Watson and the #40 of Mike Landry on the front row with points leaders Dan McKeage in the #38 and Jerry Harrison in the #48H in the second row. 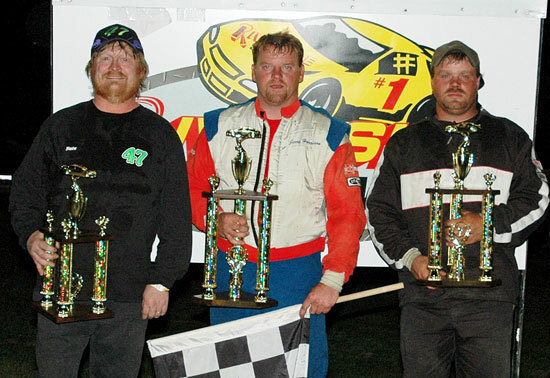 Things change quickly in PASS Sportsman racing, and before they made it to turn two Watson pushed up taking Landry and Harrison high with him, and McKeage was the leader by the time they hit the backstretch. Several cars, including Landry, had to pit. 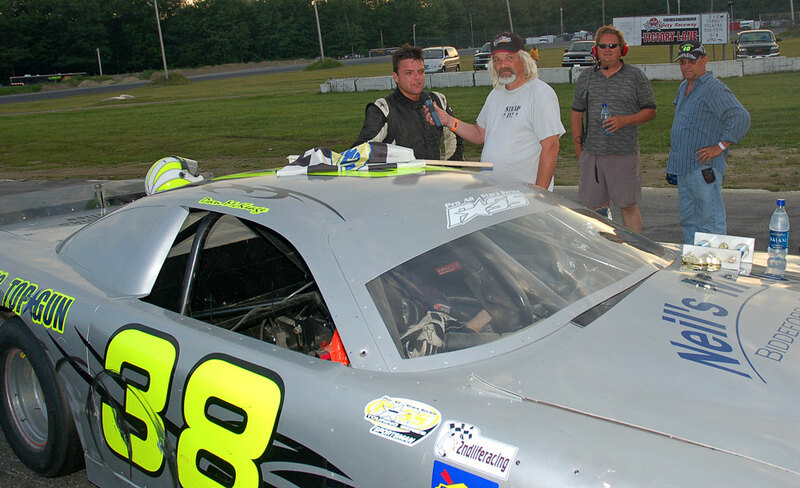 McKeage and Harrison were out front with Justin Karkos in the #18 settling in at third. Everything changed again on lap 14 when McKeage had a flat right front in front of the entire field sending everyone scrambling to avoid the slowing #38. On the restart, it was Karkos and Landry with Harrison and the #03 of local All Star competitor Tony Carroll right behind. At the 25 lap mark, it was Landry in cruise control, Harrison, the #47 of Nate Weston, the #35 of Bobby Nadeau, the #55X of Kurt Hewins fifth. At lap 47, the “Traveling Man” Pete Fiandaca in his legendary #135 orange coupe went around in turn three bringing out the yellow. 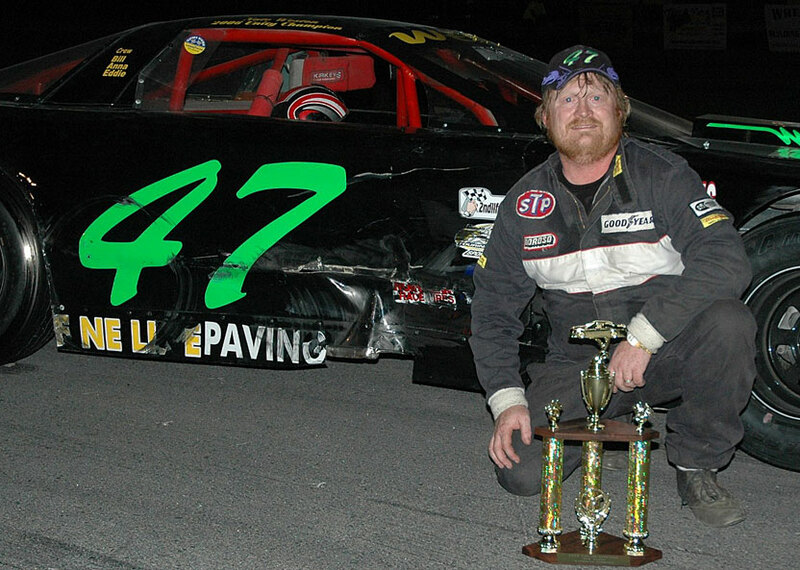 At the 50 lap mark, it was still Landry out front in the great looking #40, followed by Weston, Harrison, Carroll, the 2007 All Star Speedway Super Street Champion Ron Bolduc in the #95 after battling his way into the top five, and McKeage back up to sixth after visiting the pits. The first shower of the night hit on lap 60 bringing out a yellow, but the cars kept the track dry and after a 15 minute delay they went back green for the finish. Weston tried Landry on the outside for several laps, but the #40 was too strong and Weston was forced to fall in line ahead of Harrison, McKeage, Bolduc, and Carroll. 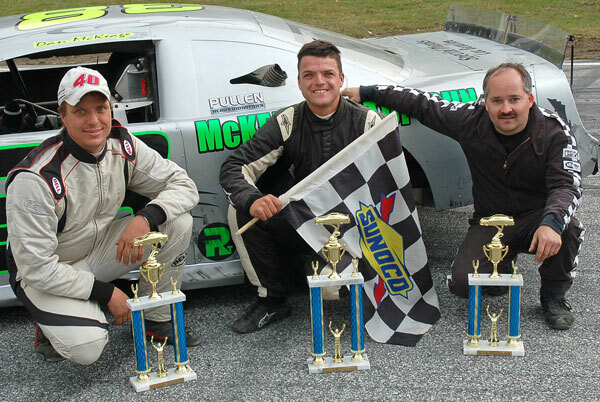 McKeage was strong on the outside, and over the last ten laps passed Harrison for third and added two points to his lead going into the season finale on Sunday afternoon October 14th at White Mountain Motorsports Park, N., Woodstock, NH as part of the big two-day PASS Championship Weekend. 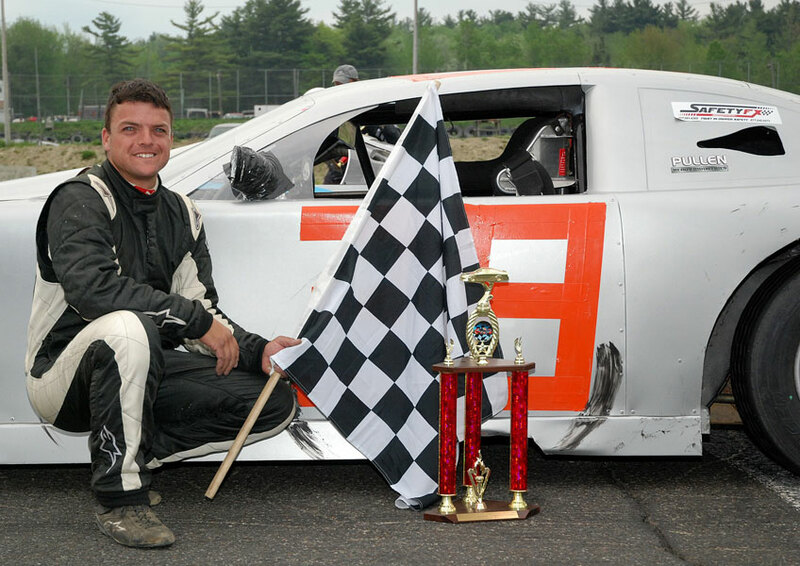 Landry took the checkers at lap 75, followed by Weston, McKeage, Harrison, Bolduc, and Carroll. 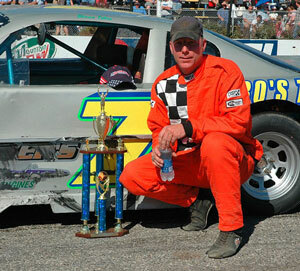 Just like in the series’ inaugural race at Speedway 95 earlier this year, Dan McKeage was the race winner. 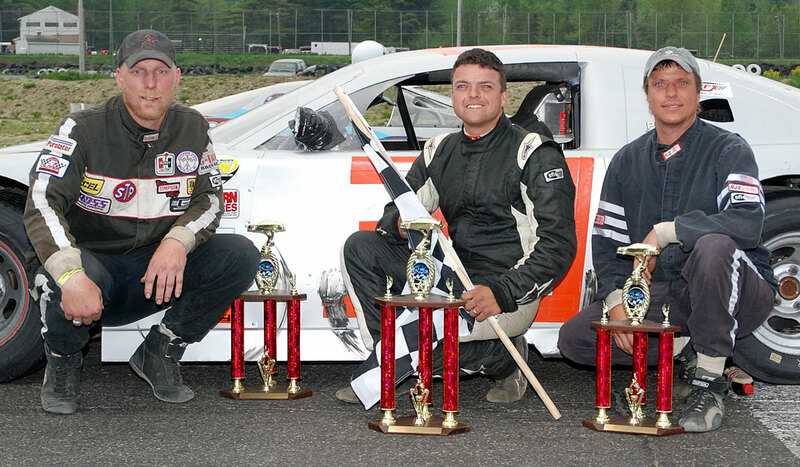 This time, he finished ahead of Nate Weston, Mike Clark and Joey Doiron. Doiron’s top five was particularly impressive. 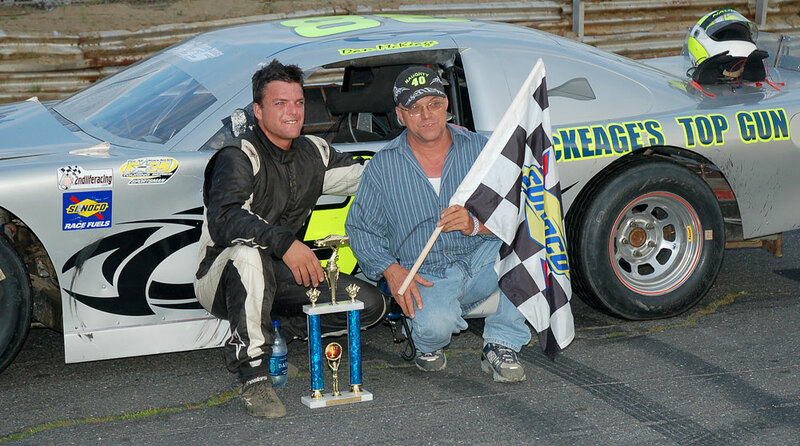 The teenager is a rookie in the Sports Series at Beech Ridge Motor Speedway (ME) and decided on Sunday morning to come to Unity and make his PASS debut without the extra day of practice that most teams enjoyed on Saturday afternoon. Pullen Heavy Industries specializes in any needs you may have for aggregate materials, bank sand, crushed stone/gravel, screened loam and ¾” reclaim asphalt is also available. They serve both commercial and residential customers. Delivery is also available. Pullen Heavy Industries is located at 54 New County Road, Saco, Maine 04072; call 207-283-4311 for information or to place an order. 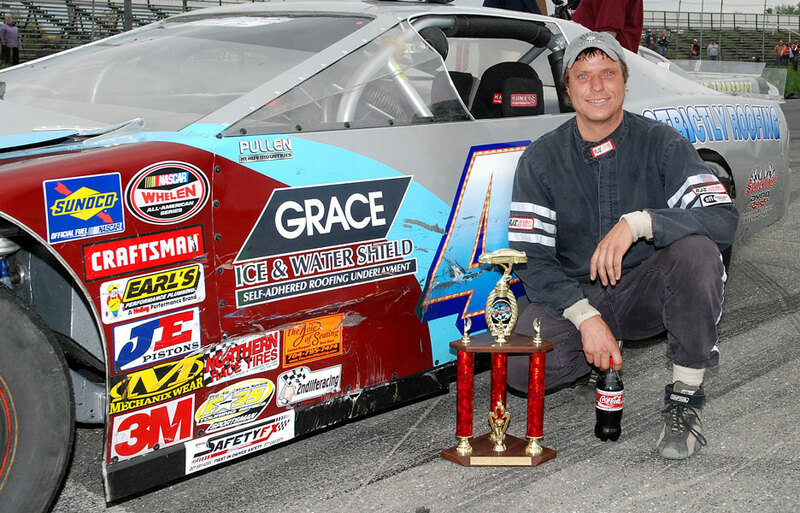 “Having started my racing career in this type of racecar, it made me want to do something to show my support towards this division,” said Scott Pullen, owner of Pullen Heavy Industries. 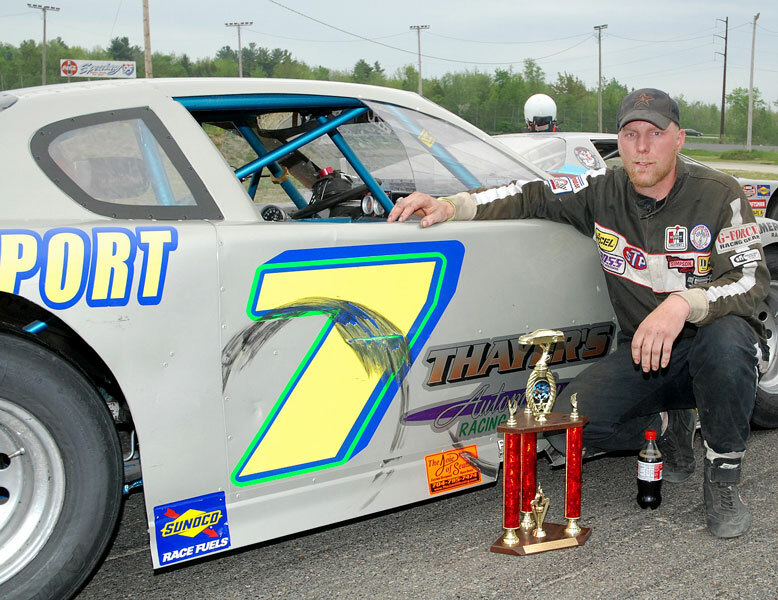 To show his support he has, not only come on board as the Title Sponsor for the Sportsman Series, he has also offered contingency awards at each of the seven (7) races this year. He is sponsoring a weekly Hardcharger Award for the amount of $100.00. The Hardcharger award will be awarded to the driver that improves the most positions from his original starting spot by the end of the race. 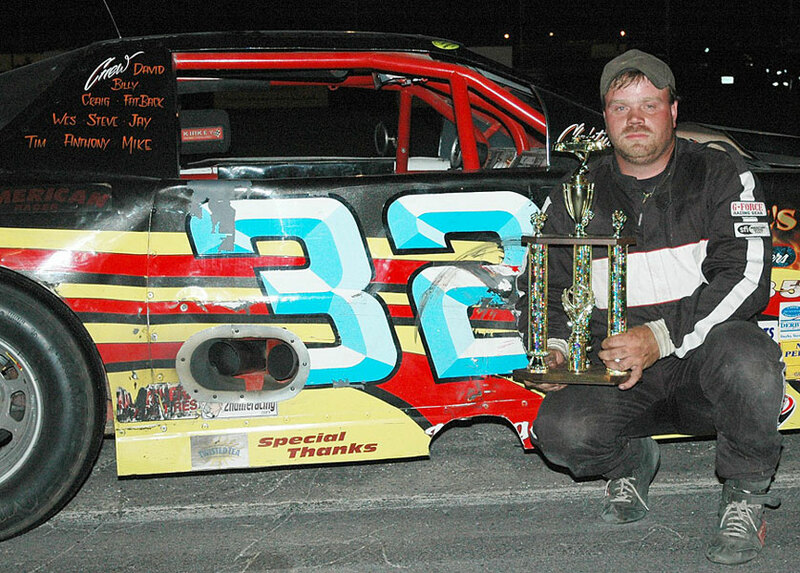 He is also sponsoring a weekly award for the driver that leads the most laps in a feature event in the amount of $100.00. 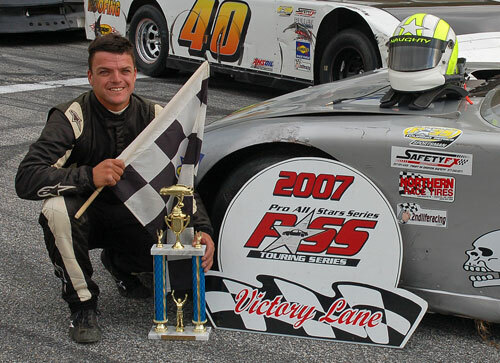 “This is where a lot of today’s Super Late Model drivers began their careers, so hopefully some of the next batch of the SLM drivers will come from this division,” said Scott. 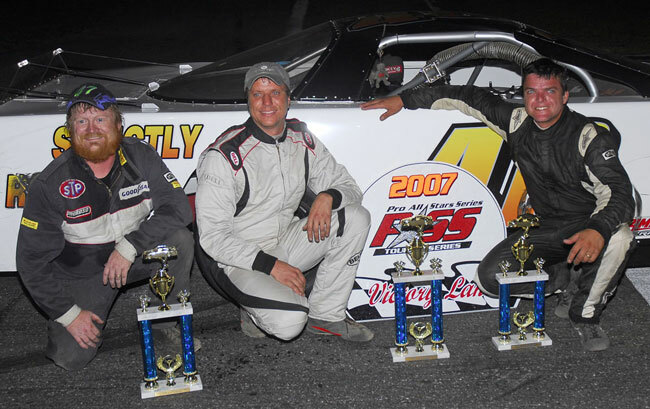 Most of the drivers from this division have in fact, come from racing their local track week in and week out. 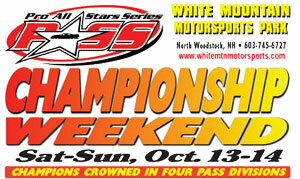 The PASS 400 weekend at Beech Ridge Motor Speedway (Scarborough, Maine) September 22nd and 23rd has become a staple among the Pro All Stars Series Schedule, offering great racing over the course of the weekend in all the different divisions. 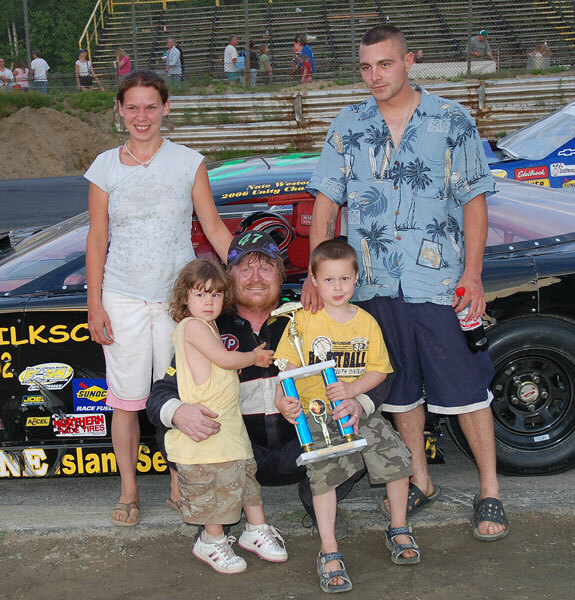 This is one reason Pullen Heavy Industries is looking forward to being the title sponsor for the Sportsman race on the great weekend.